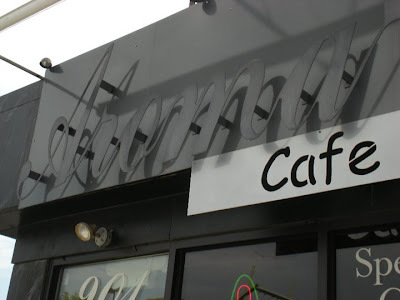 Today was the last day of business operations for one of my favorite local (and locally owned) haunts, Aroma Cafe. Located directly across the street from my place of work, this charming, friendly and creative coffee-panini-salad shop was the first place at which I ate lunch when I started at my job two years ago. I didn't really know anyone in the U of Scranton community, and so, when it was time for my first lunch break, I stepped out of the library, and scanned the nearest street (Mulberry) for possible places I might grab a bite. And there was Aroma, with its eye-catching sign that set it apart from the chain restaurant (i.e. Subway) next door. I walked across the pedestrian crosswalk at Mulberry and Monroe, and made my way inside, where a sleeping fireplace, full bookshelf, comfy couch, and scattered tables invited me to come on in and make myself at home. I don't remember what I ordered that day. But I know it was tasty, because I went back again and again, to eat the unique (and cleverly named!) sandwiches and salads that make up the menu. And to see Patty and Logan, the mother-son team who own and run the shop. I've had business meetings over lunch at Aroma. I've eaten quietly with a book at Aroma. Two years later, Patty and Logan know me by name, and I count them as two familiar faces I have come to warmly associate with the Scranton community. You cannot enter Aroma without being greeted with a smile, and not a "trained" smile but one that truly recognizes you and draws you in. The best customer service is the kind where those giving it know and care about their customers as individuals. And that's what I experienced at Aroma these past two years. The University of Scranton is building a new dormitory, which will meet a need for our students. Patty was renting the space on Mulberry from the U, and now must close it down. Today was a bittersweet day as my co-workers and friends and I dined at Aroma on Mulberry for the last time. Luckily for Scranton, they plan to reopen in the downtown area, which is maybe four blocks away from the main part of the U campus. Downtown has a different vibe than the stretch of Mulberry they formerly served. While Mulberry was mostly the student crowd, their downtown location will cater to the lunch crowd who are working professionals. I often make the four-block (10-minute -- they are long blocks!) walk into downtown proper to take my meals while at work. As such, I look forward to when Aroma reopens and Patty and Logan can yet again become a part of the tapestry that is my local community here in Scranton. 1) Shop local. There is something about a locally owned business that, somehow, makes you feel more like yourself, by its being completely itself and nothing else. This is just one of many reasons why shopping local, whenever possible, is the way to go. 2) Talk to the people who own and run the local businesses you visit, and let them talk to you. Though shy types might balk at this suggestion, the benefits really do outweigh the risks. Certainly it's important to trust your instincts about a place and its people, but if you get a sense that the place and its people are woven into your community, and you love your community, being open to knowing them and being known by them is a gift you don't want to pass up. Update, 2/14/2012: Unfortunately due to various circumstances out of Patty and Logan's control, they've had to put off reopening Aroma Cafe for the time being. I hope they know how much their delicious food and warm hospitality are missed in the local restaurant scene in Scranton. You've got a blog! I think that's basically what I use Facebook for, although the character limitation is really restrictive. How does one go about starting a blog, anyway? Great post, Donna! This really made me miss a similar cafe/daily soup/sandwich/internet cafe place I spent way too much of my time hanging out in a few years ago. The cafe was owned by the mother of one of my childhood friends, and it was great to reconnect with them. After a couple of years the finances didn't work out and they had to close down. There are lots of other cafes/coffeeshops in town, but none like this one unfortunately. Hi Donna, I got here from Ream of Paper... nice to meet you in the blog roundabout. :) You're bookmarked. Thanks s-p! Good to "meet" you as well. As I said at Ream of Paper, I'm usually a lurker, though I guess I'm coming out of my blog-speckled shell :) Love your Orthographs! Looking forward to more conversation. Any word on when Aroma will reopen?? I've been missing them since they closed!